Happy new year! 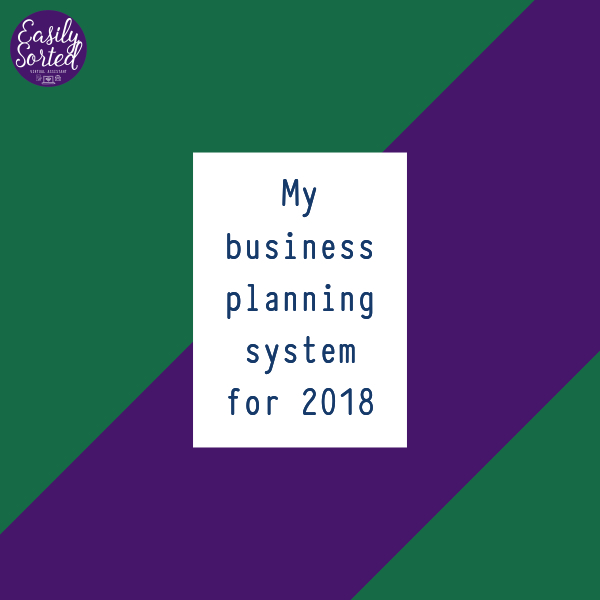 Do you have a business planning system for 2018? If you don’t, it’s not too late to get one! I know – it can be totally overwhelming to do business planning for a whole year ahead of time. Who knows what the future holds? How can we know if the project we’re pumped about today is still going to be on our minds in six months? In fact, I never really bothered with it till the last couple of years. But guess what? When I started making an effort at business planning from the beginning of the year, that’s when my business started to pick up and work better. So it’s worth setting aside some time – a couple hours, or an afternoon – to sort out what you want to do in your business for the coming year. You don’t have to stick to every little thing – but you can adopt Captain Barbosa’s attitude about the Pirates’ Code – that the Code is more like guidelines than actual rules. 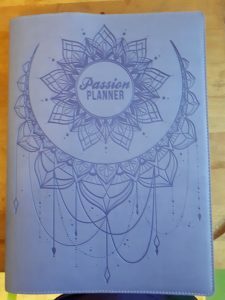 This year, I decided I needed a new planning system. The planners I’d been getting from Leonie Dawson for the last few years were great, don’t get me wrong. But I found it overwhelming and confusing having a Biz planner and a Life planner, wall calendar, and a daily desk calendar. I couldn’t keep track of which book I’d written down x, y, and z. I needed to simplify. 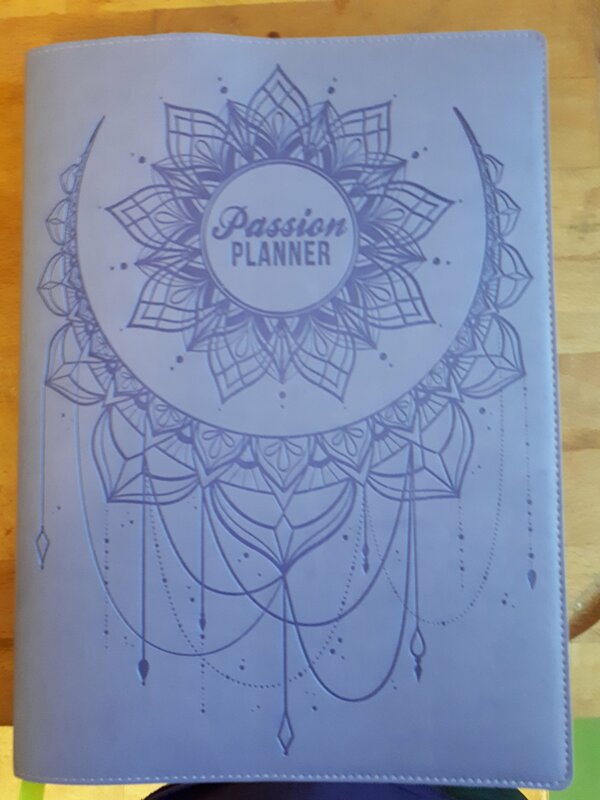 So I ordered myself a pretty purple Passion Planner. Within days of its arrival, I parked myself on the couch with my pens and sticky notes and went to town on it. The result is a system that I think will work for me, and may work for you too. First, I went through the planner and marked out all the holidays, special family days, and anything else non-negotiable. All our birthdays, our anniversary, and the Australian holidays that aren’t printed in there already. I marked these on the 2-page month spreads, and also on the individual days in the weekly timetable section. Next, I went through the Passion Roadmap for the big goals I want to work toward this year. 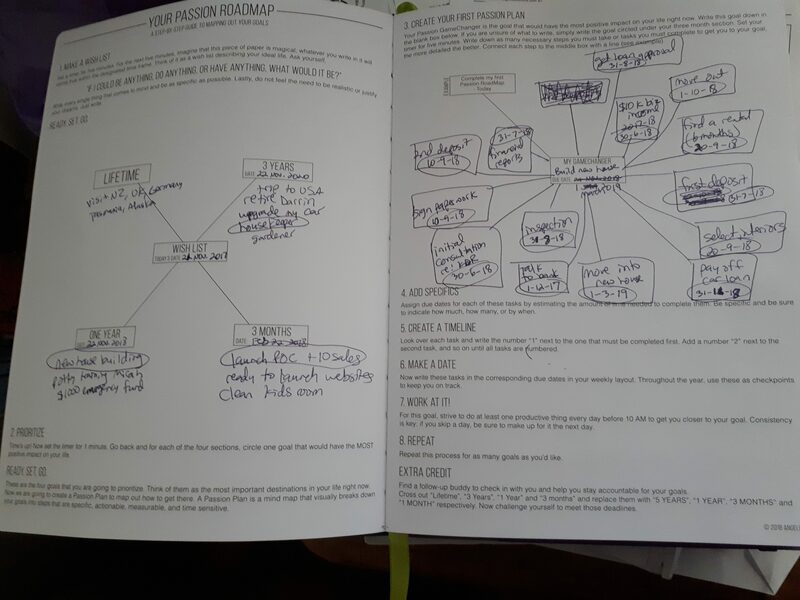 If you’re not familiar with the Passion Planner, here’s how the Passion Roadmap works. You set your timer for five minutes, and you write down everything you want to be, do, and have, and in what time frame (3 months, 1 year, 3 years, lifetime). When those 5 minutes are up, you pick out the one thing that would make the most significant difference to your life (the ‘gamechanger’) and break it down. Everything you can think of that it’ll take to make that happen. When you have all those tasks, you’re supposed to work out when they need to happen, and schedule them in your planner. Since I’m a busy mum of three, one of whom is a curious toddler and the other two homeschooling, I’m not crazy about scheduling every last little thing. 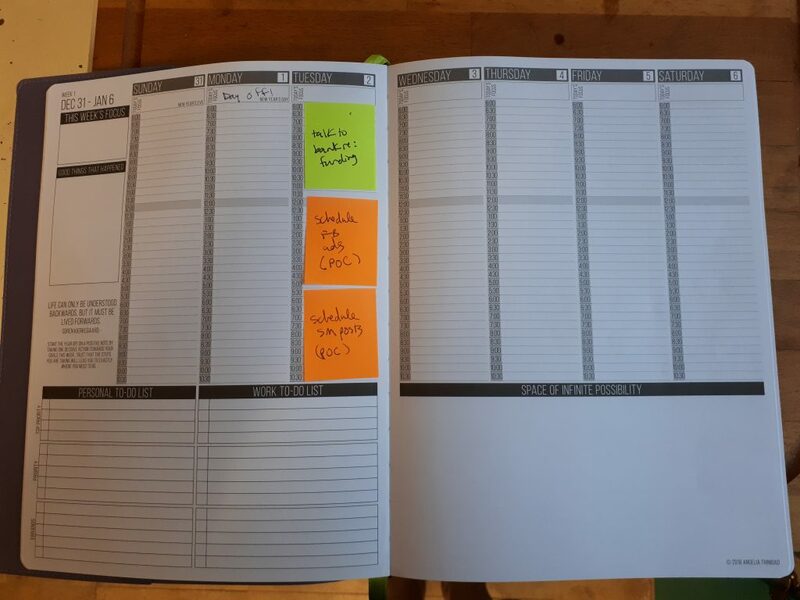 So I made one modification to this part: I wrote every task down on sticky notes, and stuck them into my planner in the week I think they’ll need to happen. This way, I don’t have to do anything on a specific day, just sometime in that week. It also means if I’m running ahead of schedule, I can tackle things earlier. If I have sick kids for a week or two (as often happens over winter), I can move those sticky notes to the next week. 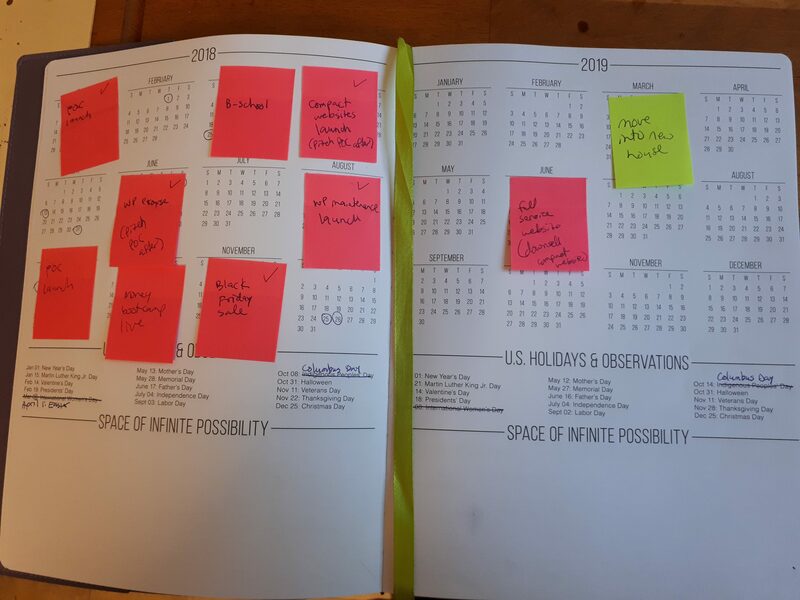 What do you think of my flexible business planning system? Do you think it could work for you? Or, do you have a system already that you love?